Photo by Brandon Macz: John Hay Elementary students Mile DiBona and Georgia and Oliver Forsberg present a $600 check to principal Tami Beach and assistant principal Michael Berkenwald on Wednesday, Nov. 14. 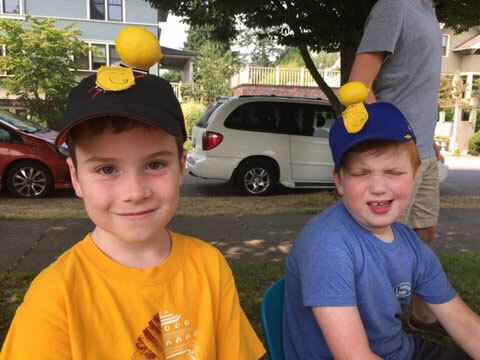 Photo courtesy of Jill Campbell: Friends Oliver Forsberg and Miles DiBona started raising money for the new John Hay playground with a lemonade stand two years ago. 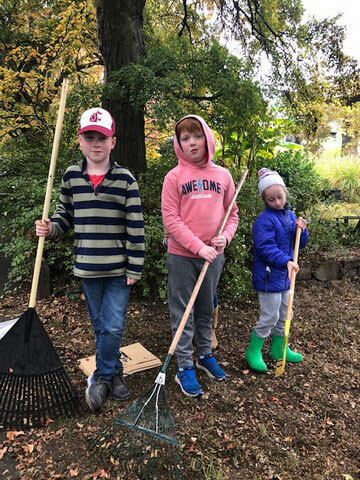 Photo courtesy of Jill Campbell: They moved to raking leaves this fall, adding Oliver's sister, Georgia Forsberg, to the business. 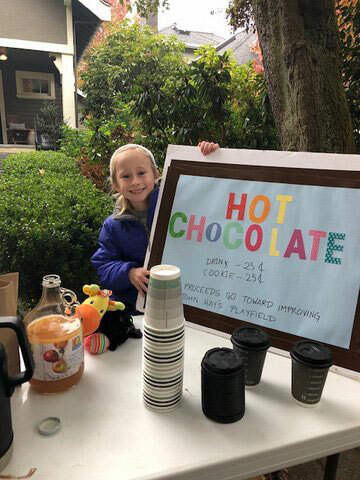 Georgia Forsberg, 6, making a strong case for hot chocolate. Oliver Forsberg knew from a young age that John Hay Elementary was in need of better accommodations for him and his fellow students. “We thought we needed a new playground, the playground is bad,” said the 9-year-old John Hay student. Like any child would, he called a meeting with principal Tami Beach to talk business. “He came to me with a real business-like meeting, talking about how they’d raised this money,” Beach said. Forsberg teamed up with his friend Mile DiBona, 9, to raise funds for a new playground, which was already in the works with the John Hay Partners group. Combining their nicknames, the O-Mi company was formed two years ago, starting with a lemonade stand that brought in $81. They diversified this fall, adding leaf raking and hot chocolate sales around their Queen Anne neighborhood, and bringing Forsberg’s 6-year-old sister, Georgia, into the business; it was rebranded as Oh Ge O-Mi. Homeowners were asked to give what they could, and that came out to $300. The Forsberg sibling’s father works for Microsoft, which matched their raking funds, bringing the total raised for the playground to $600. The students presented Beach with an obligatory oversized check on Wednesday night, Nov. 14, while a parent signed one a bank would accept. Grownup volunteers put the playground together on Saturday, Nov. 3. Forsberg couldn’t help with that, he said, but did get to work on the plantings. 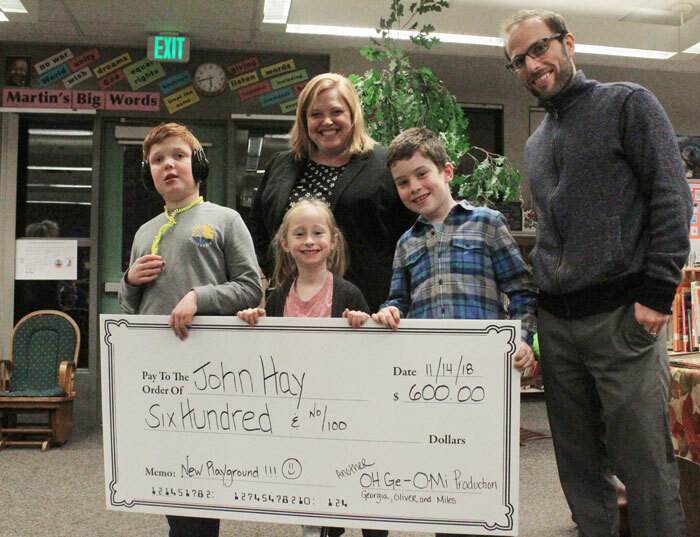 The playground project was spearheaded by John Hay Partners — a combination of the PTA, administrative site council and nonprofit John Hay Foundation — and was partly funded by $40,675 in donations during a spring fundraiser last year. Funds raised by the elementary entrepreneurs could go toward a second phase of playground development in the future. Beach said the playground is still slated to open to anxious students in December. “I’m excited to try out the spinning merry-go-round thing and the netting you climb on,” Forsberg said. But the fundraising isn’t over, and Forsberg said he and DiBona are talking about doing a car wash in the spring. Once the playground is tip-top, the business partners will have to find something else to do with their profits. “Once the playground is done, we’re just going to raise money to go movies and stuff,” Forsberg said.